Gismondine, Osa Quarry, near Rome, Italy. Rivadavite, Tincalayu borax deposit, Argentina. Draw your own crystals. Go to the new crystal drawing page here: crystal drawing. You can create your own crystals, and save them as image or data file. 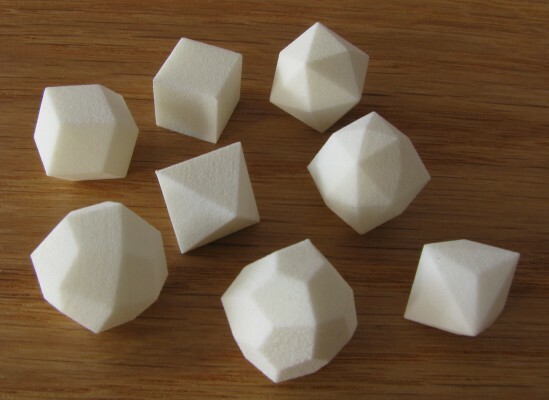 I offer real crystals, 3D-printed, physical objects made from plastic. More information is here. Dexter now is available as freeware. Dexter is the crystal drawing program we used to create al the crystals on this site. Click here to download it. All material on this website and webserver is copyright © 2004 - 2014 Mark Holtkamp (www.smorf.nl). This includes the program code and the crystallographic data files. If you are interested in obtaining images or drawings, email me. Most of the crystals are based on drawings in the "Atlas der Krystallformen" by V.M. Goldschmidt, a monumental work with more than 20.000 crystal drawings. It was published between 1913 and 1923.